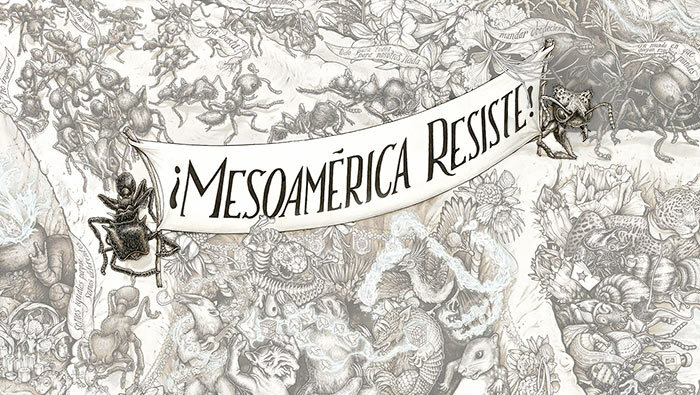 The Beehive’s much anticipated graphic, Mesoamérica Resiste, is finally hatching! After 9 years of collaborative research, story gathering, design, and illustration, The Beehive Collective is thrilled to announce the release of the Mesoamérica Resiste graphics campaign.You may have seen The Beehive Collective’s work when OKT helped bring them to Grand Rapids in 2011. Click here to see the launch video and to contribute to the project. The Mesoamérica Resiste graphicillustrates stories of resistance, resilience, and solidarity from Mexico to Colombia. The double-sided poster focuses on the clash between two very different worldviews. When folded, the outside of the poster is the top-down view: a map of megaprojects planned for the region that draws parallels between colonial history and modern day capitalism. The poster opens up to reveal the view from below: amidst the roots of a Ceiba tree, communities are fighting off the invasion of the plans on the map, defending their land and traditions, building local and regional economies, and exercising their collective power. The graphic is a powerful tool for learning about the importance of cultural and ecological diversity, with a cast of characters that includes over 400 endemic species of plants, animals, and insects.